The Canadian Pacific liner EMPRESS OF ENGLAND of 1957. 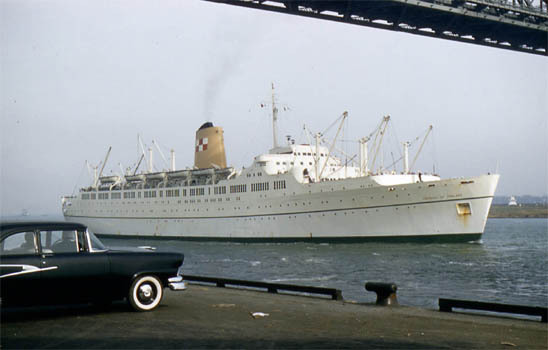 The EMPRESS OF ENGLAND of 1957 was virtually an exact sister to the EMPRESS OF BRITAIN and was built for Canadian Pacific's Liverpool to Montreal service. 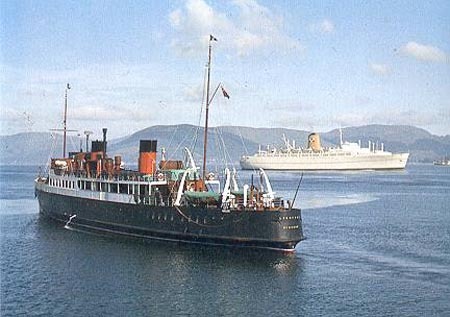 Company's paddle steamer CALEDONIA alongside, acting as tender. 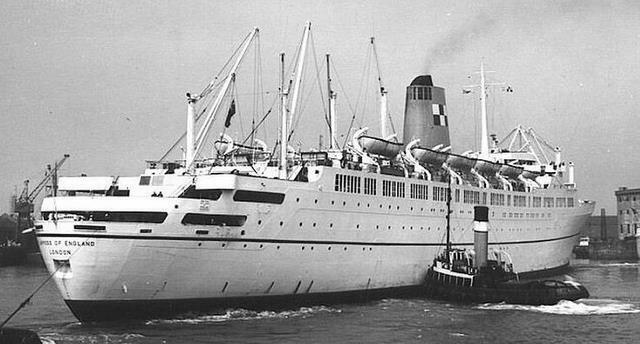 Lady Eden, the wife of Britain's Prime Minister, launched the EMPRESS OF ENGLAND on 9th May 1956. Speaking after the launch, Lady Eden said: "This must be a day of satisfaction for Canadian Pacific. War brought the almost complete annihilation of the 'Empress' class of ships, and I believe it is true that no other line suffered as heavily as yours. We in Britain will never forget the brave part your ships played in the dark years. They brought your [Canadian] soldiers to these shores and they help to keep this island supplied. They made resistance possible." at Montreal on the occasion of her maiden arrival on 25th April 1957. 6 steam turbines, double-reduction gearing to twin screws. Speed: 20 knots. A strike that would shut down all British shipyards was due to start at noon on 16th March 1957, the day that the new EMPRESS OF ENGLAND was due to sail for her sea trials. In the event, the new Empress left the Tyne with just half an hour to spare before becoming caught up in the unrest. She sailed to the Firth of Clyde for speed trials over the Arran Mile, and then spent some time at Glasgow before arriving at Liverpool on 26th March. 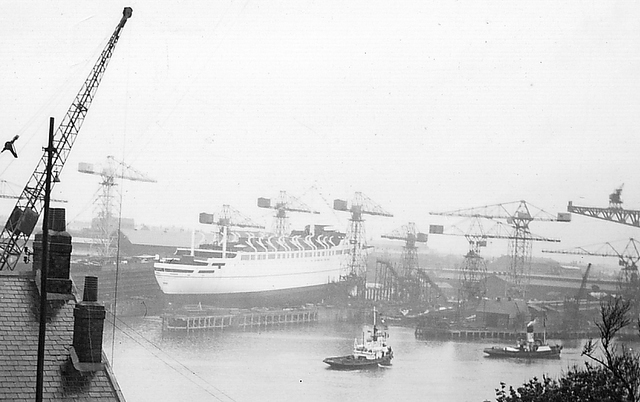 her launch by Lady Eden on 9th May 1956. The new EMPRESS OF ENGLAND was to all intents and purposes an exact sister to the slightly older EMPRESS OF BRITAIN. 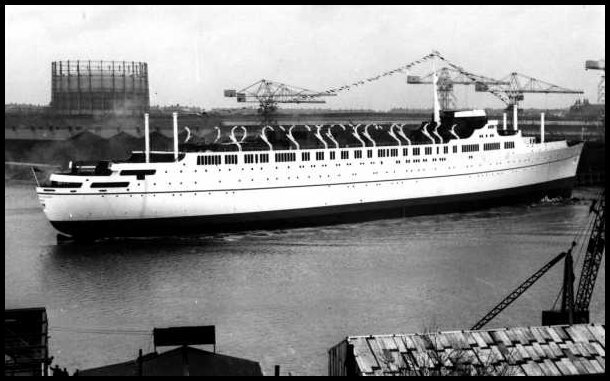 She sailed on her maiden voage from Liverpool to Quebec and Montreal on 18th April 1957 with a full complement of 158 first-class and 900 tourist-class passengers. Both the new Canadian Pacific liners carried a full crew of 464. They both had 380,650 cubic feet of cargo space, of which 80,000 cubic feet were refrigerated. As with Cunard's SAXONIA-class, this massive capacity was never fully utilised, given the strict time-table of the passenger schedule. As was the case with the EMPRESS OF BRITAIN, both first and tourist-class passengers shared the ship's principal public room, the 'Empress Room'. The ship was fully air-conditioned and all the tourist-class cabins on 'A'-deck were equipped with private showers and toilets - two decided advantages over the Cunard ships. Denny-Brown stablilisers were fitted, which, it was claimed, could reduce an eighteen degree roll to one of less that six degrees. With the entry into service of the EMPRESS OF ENGLAND, Canadian Pacific operated four passenger liners on the North Atlantic in 1957. The new ship had some engine problems on her second voyage, resulting in her being two days late arriving back at Liverpool. On 29th August 1957 she was in collision with the ore carrier SEPT ILES at Quebec. The new EMPRESS OF ENGLAND was sent cruising to the Caribbean from New York between 15th January and 28th March 1958, but she was back on the Canadian service on 18th April. The EMPRESS OF BRITAIN had been left to maintain a winter service between Liverpool and St John, New Brunswick. From 1958, a call at Greenock was re-introduced into Canadian Pacific's sailing schedules. These calls had been dropped in post-war years in an attempt to speed up passage times. The EMPRESS OF ENGLAND at anchor at the Tail of the Bank off Greenock. David MacBrayne's LOCHFYNE is acting as her tender. The EMPRESS OF ENGLAND's winter cruising programme from New York was highly successful, and she was joined by the EMPRESS OF BRITAIN in January 1960. In the summer of 1960, strike action severely disrupted Canadian Pacific sailings from Liverpool. The EMPRESS OF ENGLAND had two voyages cancelled at the height of the season - in July and August - as a result of members of the National Union of Seamen refusing to sail unless their demands for higher basic pay and a shorter working week were met. Many intending passengers were forced to fly the Atlantic, and it was not until 10th September 1960 that the EMPRESS OF ENGLAND resumed service. With a full complement of passengers, the Empress was short of crew and, although she was delayed at Greenock for twelve hours whilst additional stewards were signed-on, it was still not enough to provide the traditional Canadian Pacific service. Each passenger was given a letter from the Company pointing out the difficulties. The letter stated: 'The entire ship's company will do all they can to give you service and assistance during the voyage, but because of the shortage of staff, meals may have to be curtailed and personal service may not always be as readily available as on a normal voyage'. into the Gladstone River Entrance lock at Liverpool. 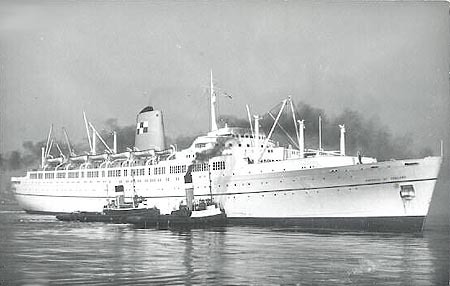 Whilst the EMPRESS OF ENGLAND was in port at Montreal in September 1960, a series of fires broke out in five passenger cabins, and arson was suspected. In January 1962 the EMPRESS OF ENGLAND operated Canadian Pacific's first cruises out of Liverpool since before the Second World War. The EMPRESS OF ENGLAND was overhauled as usual at Liverpool at the end of 1962, and in severe gales on 17th December the liner broke adrift after ripping a mooring bollard out of the quay. 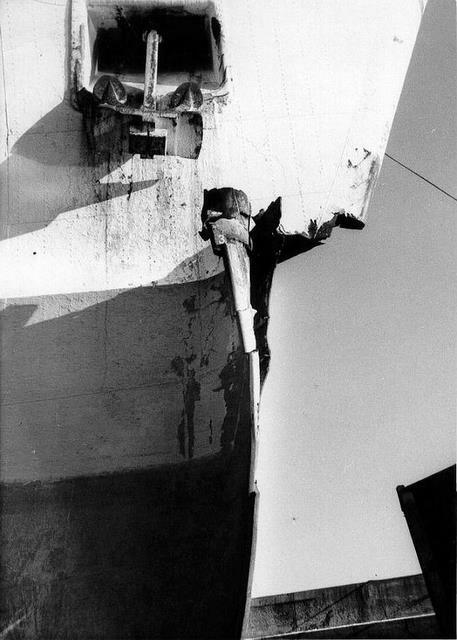 Members of the skeleton crew on board fought to save her from extensive damage as she swung round on her bow moorings. As the Empress swung across the dock basin her sirens sounded a warning and the tugs AYSGARTH and HAZELGARTH went to her assistance. 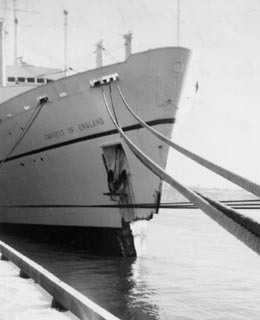 The chief officer, Mr Wylie, ordered the stern anchor to be dropped. Left: the EMPRESS OF ENGLAND's damaged stem; Right: in Gladstone Graving Dock for repairs. The liner struck the knuckle between the entrance to the Hornby Lock and the Gladstone River Entrance, causing a twenty-foot gash in her side, just forward of the bridge. Her stem was also severely buckled. The EMPRESS OF ENGLAND was made fast in the position in which she had come to rest, blocking both the Hornby Lock and the river entrance, and trapping the tug AYSGARTH in the lock chamber. After jamming the Gladstone dock system for twelve hours, the Empress was pulled off the knuckle and edged back into No 1 Branch Dock. The year 1963 marked an acceleration in the rapid and terminal decline of the number of passengers crossing the North Atlantic by sea. Canadian Pacific reached the inevitable conclusion that it could no longer justify employing three liners on its Liverpool - Montreal service. It has to be said that Canadian Pacific had been involved in airline operations for many years, as part of its claim to be 'the world's most complete transportation system'. Other shipowners purchased interests in airlines, notably the Cunard/BOAC association. Bridge on her maiden arrival at Montreal. 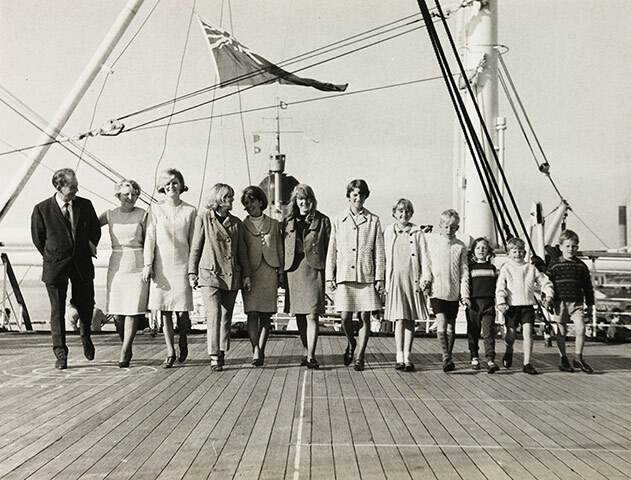 When Max Wilson and his Travel Savings Association (TSA) arrived on the scene in 1963, Canadian Pacific was only too happy to charter the EMPRESS OF ENGLAND and the EMPRESS OF BRITAIN to operate TSA cruises, and to acquire a 51% interest in the business. On 28th November 1963 the EMPRESS OF ENGLAND sailed for Cape Town on TSA charter and operate cruises across the South Atlantic to Brazil and Argentina, and also along the east coast of Africa. The TSA bubble quickly burst and by April 1964 the EMPRESS OF ENGLAND and the EMPRESS OF CANADA were back on the St Lawrence run. (The EMPRESS OF BRITAIN had been sold to the Greek Line at the end of her TSA charter). With a two-ship service on the North Atlantic, passenger occupancy improved with an average of 930 passengers on westbound sailings, and 735 on eastbound crossings being achieved. Many business passengers flew to Canada and then returned to the UK by ship. Canadian Pacific's European Manager was in 'gung-ho' mood when he said in September 1964: "As far as Canadian Pacific is concerned, we are prepared to stay on the North Atlantic as long as business is profitable. Demand may well outstrip supply. Canadian Pacific is staying in the passenger business!" 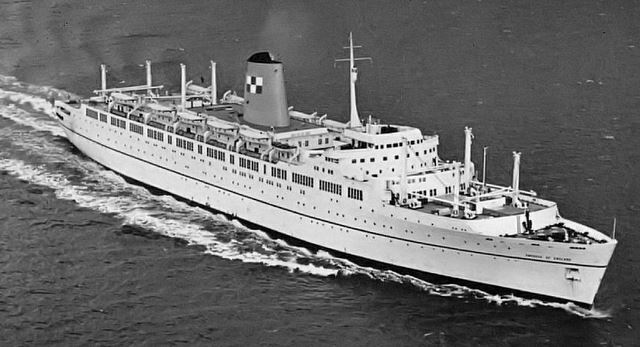 Following another winter of cruising, the EMPRESS OF ENGLAND resumed service between Liverpool and Montreal in April 1965. There were still crew problems and in an effort to minimise these, the EMPRESS OF ENGLAND became the first British liner to carry Nation Union of Seamen shop stewards and a union convenor. "This is a new page in maritime history", enthused one union official. The statistics for 1965 showed that 26,000 passengers had crossed the Atlantic by sea to Canada, whilst 350,000 had elected to fly. On 8th November 1965 the EMPRESS OF ENGLAND collided with the 12,000- ton Norwegian tanker LIFJORD in the St Lawrence at the height of a fierce blizzard. The Empress's bows were holed and her stern damaged, resulting in five days of temporary repairs which were carried out at Quebec. The liner was back in Liverpool on 4th December for her annual overhaul before starting another winter cruising programme. In 1966 the EMPRESS OF ENGLAND sailed for Canada on 26th April and returned to Liverpool on 12th May, just in time to coincide with the start of the six-week seamen's strike on 15th May. With the Atlantic passenger trade in terminal decline this strike, at the height of the season, was nothing less than a death blow. It was not until 14th July that the EMPRESS OF ENGLAND resumed her sailings. In 1967 the Cunard Line announced its withdrawal from operating passenger services to Canada. Its liners on the route, the CARINTHIA and the SYLVANIA, were not up to Canadian Pacific's standards and were not suitable for winter cruising. The EMPRESS OF ENGLAND operated her by now usual pattern of winter cruises. Christmas and New Year cruises sailed from Liverpool to the Atlantic Isles and on 8th January 1968 she sailed on her annual long winter cruise to the Caribbean. On 2nd April the Empress returned to her Liverpool - Montreal service and completed thirteen round voyages during the year. Canadian Pacific's final ever call at the Tail of the Bank, Greenock, was made on 13th November 1968 by the EMPRESS OF ENGLAND, so breaking a forty year link between Scotland and Canada. At the end of 1968 the Canadian Pacific fleet was treated to a new corporate image. The famous buff funnel with the red and white chequered houseflag disappeared to make way for a new funnel design made up of two shades of green depicted in curious shapes on a white background. Canadian Pacific described the new corporate painting (graffiti ?) as a 'triangle to represent motion, a circle for global operations, and a square for stability!' The narrow green sheer line on the hull was repainted in a much broader form. Maybe Canadian Pacific's directors had been a little high on Lily the Pink's 'medicinal compound' when they authorised this atrocity which met with univeral disapproval. which was applied at the end of 1968. This met with universal condemnation. Canadian Pacific's public relations representative, John D. MacGregor, commented: "It would be a pity if we have given the impression that we have just slapped a new coat of paint in strange colours over our two ocean liners and left it at that. This has not been an isolated 'paint job'. The entire Canadian Pacific transportation complex is undergoing a profound change to draw together under a unique symbol all the diverse entities that make up the whole. These major changes affect not only our liners but the cargo fleet, international airline, railway system, hotels, trucking and hotel operations. The purpose of this mammoth task which will take up to five years to complete is to bring a clear and indentifiable picture for all to see of this company's worldwide activities." Just fancy that !!! 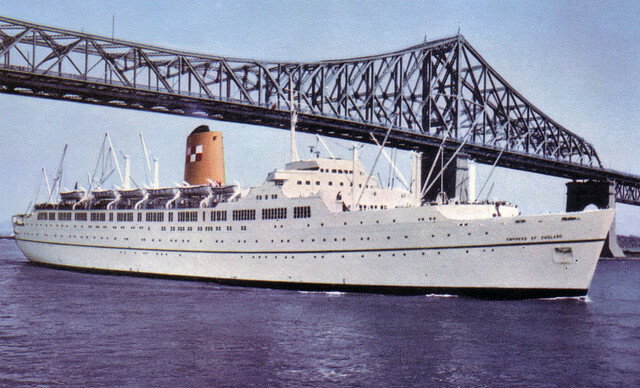 In 1969 the EMPRESS OF ENGLAND was the mainstay of the St Lawrence service and she completed fourteen round voyages. She left Liverpool on what was to prove her final crossing to Canada on 14th November. 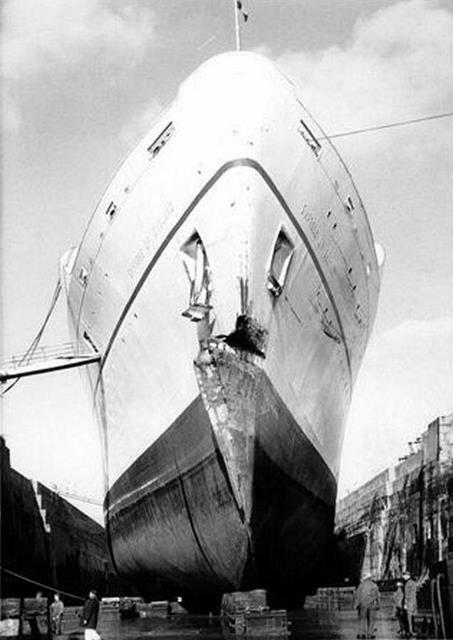 On 20th January 1970 Canadian Pacific announced its decision to dispose of the liner on 1st April, following the completion of her winter cruising programme. The ship was immediately sold to Shaw Savill for £5 million. Chairman Robert Russell said: "When the EMPRESS OF ENGLAND became available, we decided immediately that she would be a most satisfactory partner to join the NORTHERN STAR and the SOUTHERN CROSS in our extremely popular round-the-world service". On 4th April 1970 the EMPRESS OF ENGLAND was renamed OCEAN MONARCH, and a week later left Liverpool on her first voyage for Shaw Savill. She was bound for Australia via South Africa and arrived at Sydney on 15th May. This was immediately followed by a thirty-nine day cruise to Yokohama to allow her passengers to visit the World Exposition. Following more cruising from Sydney, the OCEAN MONARCH sailed back to the UK on a liner voyage, arriving at Southampton on 11th August. It was planned to give the OCEAN MONARCH a £2 million refit at Cammell Laird's Birkenhead yard. The project manager, Mr William Cooke, said: "The conversion is an extremely big job and has to be carried out in a comparatively short time. I would like to say that our chances of improving on the schedule are slim, compared with our chances of over-running it!" 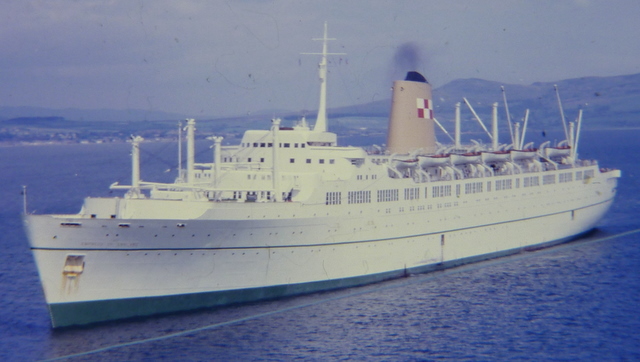 The OCEAN MONARCH arrived at Birkenhead on 17th September 1970. The refit was beset with problems, labour unrest and strikes. 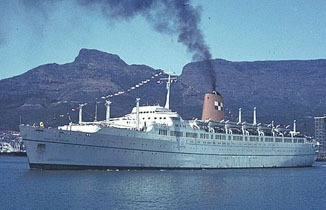 The liner was scheduled to be back in service on 23rd August 1971, but it was 17th September 1971 before the refit was complete. 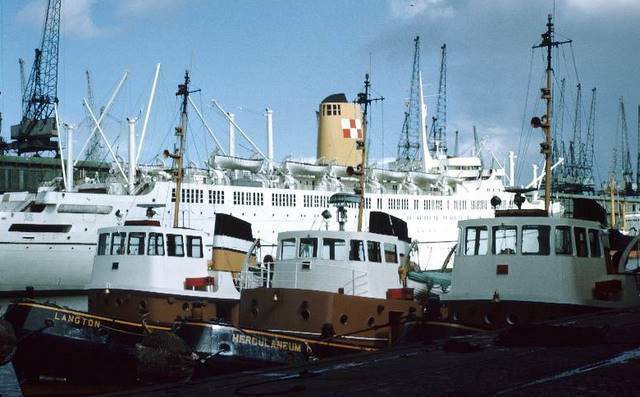 As a result Shaw Savill had to cancel seven out of the eight planned summer cruises for the OCEAN MONARCH, and lost an estimated £12 million in passenger revenue. The final cost of the refit doubled to £4 million, and Cammell Laird lost an estimate £1.2 million, due to its under estimation of the refit costs. The OCEAN MONARCH sailed from Southampton on 16th October 1971, fully booked on the first and last cruise of her original summer schedule. On 5th November she sailed from Southampton 'west-about' to Sydney, from where she cruised to New Zealand and the South Pacific Islands. 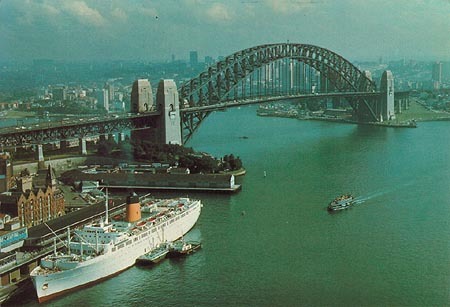 A liner voyage back to the UK followed where she arrived on 4th April 1972, and eight days later the OCEAN MONARCH left on a seventy-four day, round-the-world voyage. Crew unrest continually dogged the OCEAN MONARCH. On 22nd January 1973 half her crew staged a walk-off at Sydney. Replacements were flown out from the UK. In 1974 persistent boiler problems occurred, requiring a large amount of costly and time-consuming work to rectify. 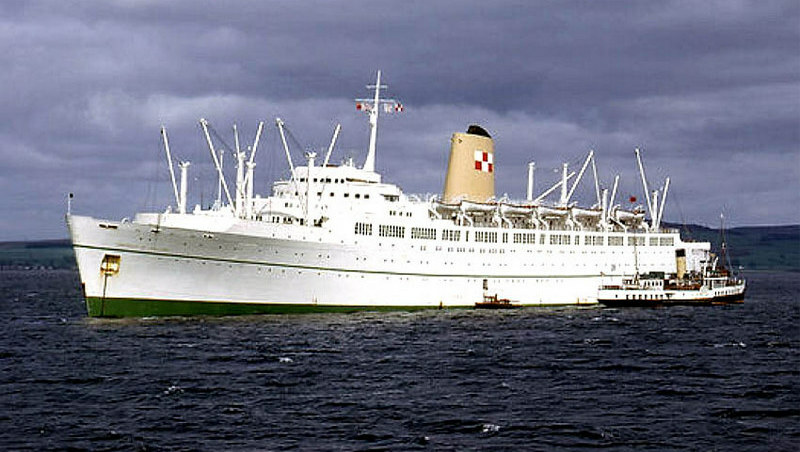 On 1st April 1975 Shaw Savill announced that it would be withdrawing the OCEAN MONARCH from service. The company said that passenger shipping was no longer a viable option as a result of inflated manning and bunkering costs. It had been necessary to raise cruise fares by 30 per cent, and further increases were inevitable. 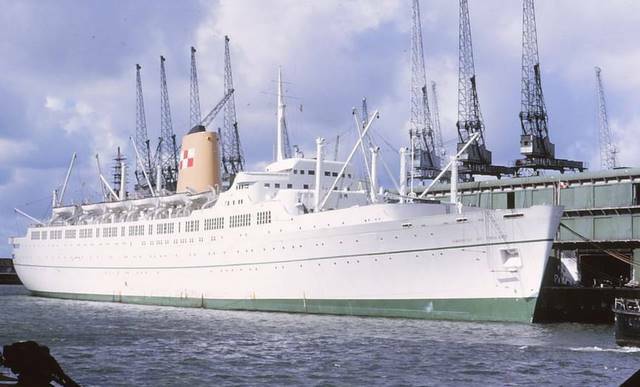 Following the OCEAN MONARCH's arrival at Southampton on 5th June 1975, the ship was sold to Taiwanese shipbreakers. 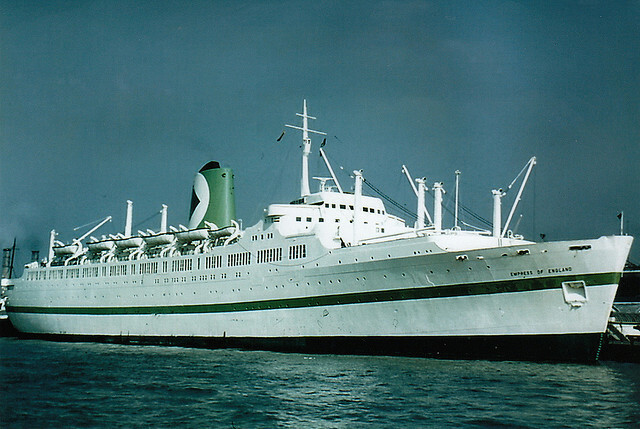 She left Southampton on 13th June and reached Kaohsiung on 17th July 1975 for demolition. 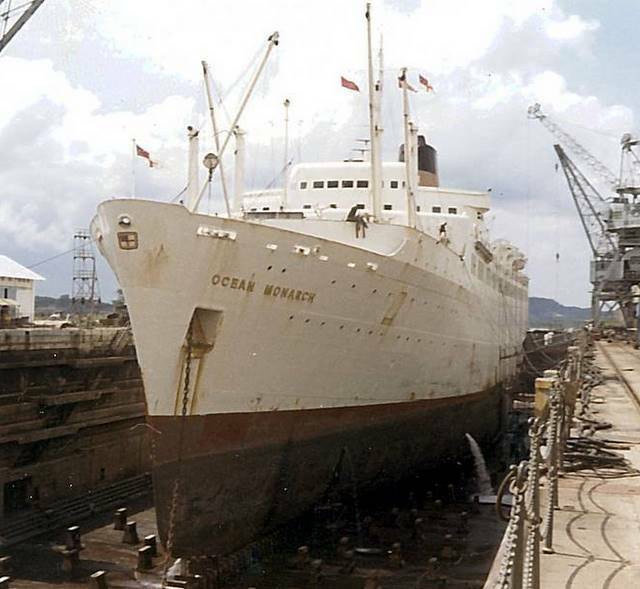 Speaking at Shaw Savill's Annual General Meeting in June 1975, Chairman Lord Beeching said: "Ships such as the OCEAN MONARCH inspire a strong sentimental attachment, and I am sure that many of our shareholders will regret her passing, just as we do. Nevertheless, it must be said that from a financial point of view the OCEAN MONARCH's disposal gives rise to nothing but a sigh of relief. She has become a loss-making worry, and there can be no surer way of improving profitability than by withdrawing her from service."